Gobble, gobble!! :) Isn't this turkey just adorable? He is all dressed up and ready to say 'Happy Thanksgiving' to someone special!! To create this Thanksgiving Easel Card, I started with a 4"x12" strip of Cloud Cardstock and scored it at 6" and 9.5". I then used the D'Vine Swirls embossing folder on the front top (above the fold) of the card. The 3"x4" Gold Cardstock was Cuttlebugged with the Houndstooth embossing folder and adhered to the bottom half of the card base (front, below the fold). The turkey (Create A Critter Cartridge) was cut at 4" using the Fit to Length Feature on my Cricut Expression Machine (this allowed me to cut the turkey to the width of 4" rather than height -- perfect for when I want to fill up the width of a card -- it automatically adjusts the height to the width ratio). Once the pieces were adhered together, the turkey was attached only to the gold cardstock (so he would pop up above the fold when opened). On the inside of the card, the Happy Thanksgiving sentiment was cut at 2" from the Wild Card Cartridge. After adhering the sentiment to the gold strip (1/2"x4"), it was adhered to the orange strip (2.5"x4"), and popped up with a strip of fun foam (or pop dots). The dimension is needed to create a 'ledge' for the bottom front of the card to rest behind when open. This is card #7 for this month's card class on October 27. 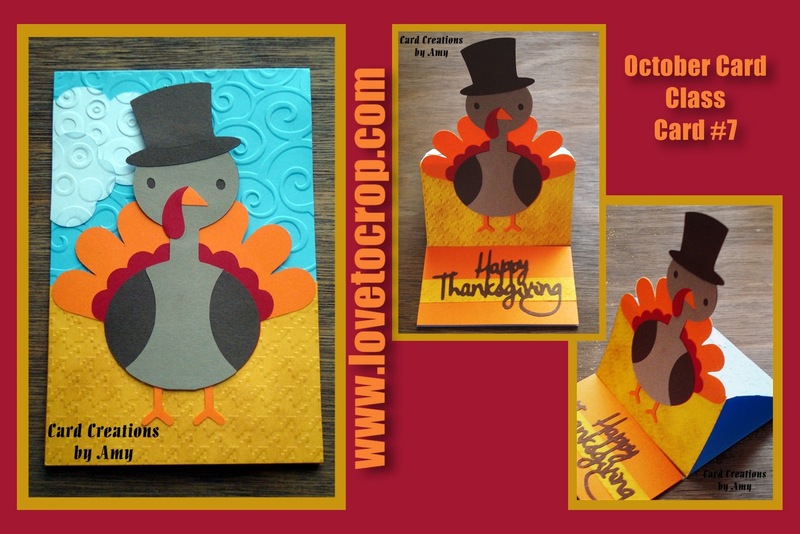 Participants create 8 fun cards perfect for sending to family and friends... The best part is that all the hard work is already completed (ya know, the designing, the cutting, etc.)... If you would like more information about my card classes, or to purchase a spot (or just a kit), please email me at scrapbookingwithamy (at) gmail (dot) com. Thanks so much for stopping by!! Your comments and questions are welcomed and appreciated! !